(a) Remove the transmission control shaft lever. 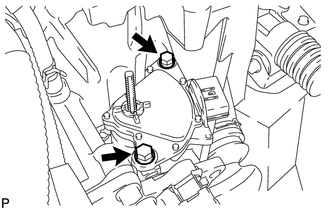 See the steps from "Remove Cool Air Intake Duct Seal" through "Remove Park/Neutral Position Switch Assembly" (See page ). (b) Loosen the 2 bolts of the park/neutral position switch. (c) Align the protrusions of the park/neutral position switch. 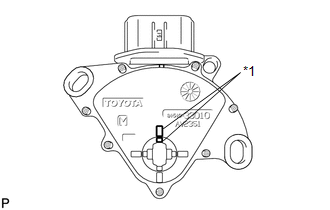 (d) Hold the park/neutral position switch in position and tighten the 2 bolts. (e) Install the transmission control shaft lever. See the steps from "Install Park/Neutral Position Switch Assembly" through "Install Cool Air Intake Duct Seal" (See page ). (f) After the adjustment, perform the switch operation check (See page ).